El-Erian is more optimistic than Gross on how the Fed will react to the drop in average earnings, but both see rate hikes this year. 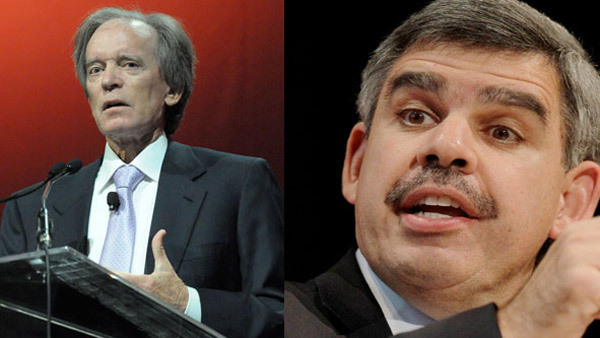 After a dramatic ending of their professional relationship and respective roles at PIMCO in 2014, Bill Gross (now at Janus) and Mohamed El-Erian (of PIMCO parent Allianz) have started off 2015 with a similar view on higher interest rates. But they had a different take on what the 0.2% drop in average wages means. Speaking on Bloomberg radio early Friday, Gross said that the Federal Reserve may be concerned about the level of economic expansion that could tolerate an uptick in interest rates, given that wage growth improvements are trailing increases in U.S. employment. Later, El-Erian spoke on Bloomberg TV about what the recent employment and wage figures mean for a possible hike in rates. On Friday, the latest jobs report showed employment growth of an estimated 252,000 positions in December, topping expectations. In addition, the jobless rate fell to 5.6%, but worker earnings unexpectedly dropped 0.2% from November. In terms of timing, he sees the change in rates as likely to happen in the summer. “The U.S. economy is on the path of recovery. It is not liftoff, but a solid recovery. And, on that basis alone, they would move this summer,” he explained. Still, Gross predicts the Fed will boost rates this year. “We’re going to see a slight rise perhaps in the Fed funds rate late in the year, but not significantly so, maybe 50 basis points by the end of the year,” he explained. The bond guru also says that the current bull markets (in equities and fixed income) could be ready for a shift. If interest rates have “nowhere to go but up, and obviously the question is by how much and when, then I think it’s fair to say that this 30-year bull market in assets, which is primarily based on financial-asset inflation and financial leverage, is certainly flattening out and may be coming to an end,” Gross said. Taxpayer Protection Act of 2015 requires preparers to demonstrate competency in preparing tax returns, claims for refunds and related documents.